Not only have I been consumed with food in the past few weeks (my jeans will attest to that), but I am consumed with all things political. Never in my adult life have I been this interested in politics or the candidates, or even the policies at hand. Consumed is being too easy on myself. My husband or family may say it is more like obsessed. The only free time I usually had was to write a blog, and that entailed getting up at the crack of dawn, or piecing notes together from my phone when I have an idea, or sadly and more frequently, ignoring my kids. I don’t want to ignore my children to indulge myself, but getting up before the sun, or forcing myself to stay awake at night after long days of cooking/cleaning/activities, is just impossible. I can’t stay up late AND I now love politics. Guess that is me now too. I have this magnetic pull to check constant updates on Twitter and FB, in between cleaning up meals and loading the dishwasher. My four year old says “one more minute” when asked to do something else while playing or watching a show. I say it…too much unfortunately. It used to be so I could write…but now it is what is trending on the political front on Twitter or latest coverage from a Primary state or voting day. He is learning to buy some more time and be selfish like his mother, instead of doing what needs to be done. I admit it. I own it. But as this election grows closer to November, I may become fanatical. I am pretty sure,(this being the first real election year of a social media onslaught during an election), is not helping. The media is almost controlling (we already know owning) the whole process of what we read or don’t read, which fires me up even more… and yet other people like myself are also ignoring their children or partners or pets for one more update or post one more comment/video/tweet to support their candidate. Crazy or obsessed or fanatical. But we believe in something. We believe this is our first time to really have a voice in the political process. That we can tweet to some guy in Iowa or Nebraska about what is going on in his town when the candidates were there,( or maybe even tweet with voters abroad, or get statistics on polling or percentages) is just an amazing historical political accomplishment. We believe that social media may be controlling our opinions and thoughts or complaints, but without them, we lose our ability to try…to try to speak our minds. Try to salvage what is left of this beautiful country. With that, I am done jotting notes in my phone for now, so I can get up super early and do a quick social media scan of all things political and not have to ignore my kids at breakfast. It was about ninety degrees on June 1, 1991. It felt like 110 in the shade as I lay on the steaming hot pavement in my own vomit…retching. Sobbing. I will never forget this day…ever. As an adult now, I realize I did have a choice. But when you run away from home, or get kicked out and are reliant on others…you feel like you have no choice. I woke up on the table after being sedated, in the midst of it all…the loud noise, the lights, the people hovering over me. I believe that is the moment that haunts me the most…waking, even groggy still from sedation, knowing what was happening. More so than the cowardly way I slumped in my chair in the waiting room before it began…wondering if the others were feeling the same way as me. I cried myself to sleep in the back of the car, begging for fresh air to cool my face, covered in dried vomit and tears. And the empty feeling in my belly. I clawed at my stomach screaming to make this madness stop. To undo what had happened. Next thing, I am given a Valium…out cold again. I was in a dark place mentally back then…before this all happened. It was literally my first time…and then I was pregnant. A senior in high school. An aspiring fashion designer. A child who just wanted her divorced parents’ love and for them to stop fighting. Well, this got their attention alright. They found out a while later…they shed no tears for me…just more anger and pain. I was ashamed. I kept my story to myself… I was absolved of my sin by a priest after my family found out. Time to forget it forever…put it behind me. I live with this every second of every day. I couldn’t put it behind me. Even as life moved on. But in no way shape or form, did life fill the void in my belly...in my heart. Did I want a child at eighteen? No…I had no clue what I would have done. But there is not one day since June 1, 1991 that I do not think of him…I know in my heart it was a boy. I swore God would never allow me to be happy again…my Catholic guilt growing larger everyday. God was good enough to let me heal enough to graduate and temporarily mend things with my family…but I knew that he would punish me. The little girl in me said I would never be a mommy because of what I did that day. Almost five years later, I was granted a gift. After almost losing my baby and my life during my pregnancy, God gave us a beautiful baby girl…I lost an ovary through it all, but I felt like I had truly been absolved…that there was a God and that I had to suffer a little to finally appreciate what I had. I had to embrace it. Three more amazingly beautiful children later and almost nineteen years of a happy marriage with a husband who has heard this all and held me as I cried over and over, and I feel like God forgave me…but why am I still not forgiving myself? Is it that Catholic guilt or shame? Or simply because it truly wasn’t my choice? I cringe everytime I read an article on this topic. I cry. I mourn. I had a choice. Maybe I made the wrong one, but my life would be very different today if I had fought back and said to them that I had a choice in the matter. He didn’t love me…and I didn’t love him. Yes I was a fool…but I was just looking for love after years of being lost and made a terrible mistake. I will never tell anyone to rid the world of abortion… There. I said it. It is an ugly word. Our world has made it ugly. But what about that girl who is raped or molested? What about the girl like me? I would have been sent packing to live on the streets pregnant and alone…fearful of what my very catholic family would say…or maybe worse…maybe I would have killed myself or attempted to from the deep depression and shame that was setting in. Or maybe turn to adoption…but that was never an option for some reason and I was too naive to think these things through as an eighteen year old fighting the world and everyone in it. Do I believe that maybe I could have beaten the odds? Found the strength to fight back and keep my child? Found a way to finish school and pursue my dreams as an artist? Hell yeah…I thought that an hour ago, and last week, or last summer when I almost had a nervous breakdown about the lie I have lived with for so long. Some will say I gave up too easily. But even more shame for hiding it…it is part of who I am…he was part of me and will forever be my fifth child…my first. 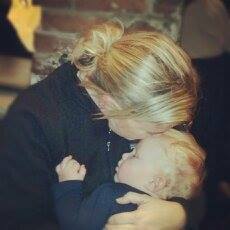 I ache for him, as any mother would over a child lost…even more so when I see how cruel life can be and take our loved ones away in an instant. So why voluntarily do it? My eighteen year old self said she did it because it was the only way out and because they told her to. My Forty-something year old self says it was the shame and guilt that the scared girl couldn’t bare to face. Took countless blows to the chin, and then when the dust settled, tucked her dirty little secret away…until now. We all have choices in this life…and we have to live with the consquences each and everyday. I feel that hot pavement from that day on my face twenty-four years ago like I am living that moment now…it was a choice…one that will follow me like a dark cloud till the day I die. Judge me, hate me, pray for me. Do whatever you like. But I will not lie or hide this part of me anymore. My older girls know my story now. As a lesson to make better choices…but no one should make those choices for you…no one. I smile today…I am owning this. 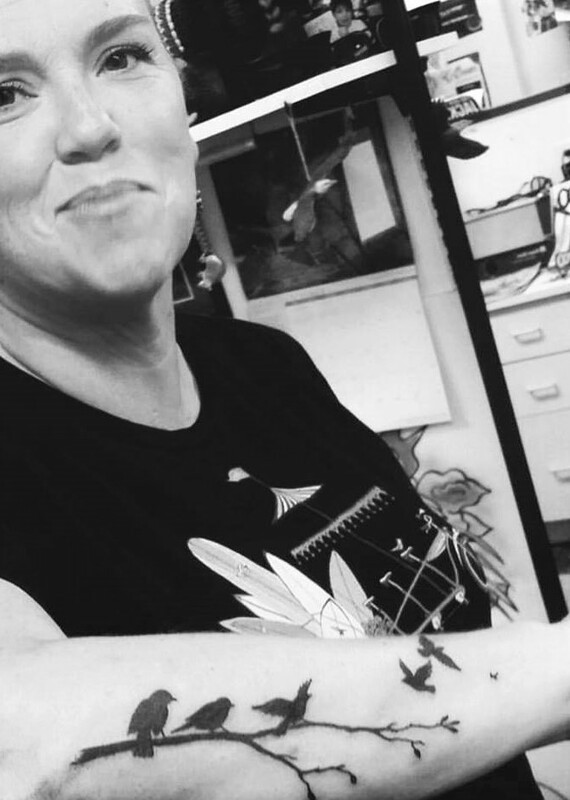 My first ever tattoo…proudly wearing a badge forever of all my babies…four born, one lost, and one gained.